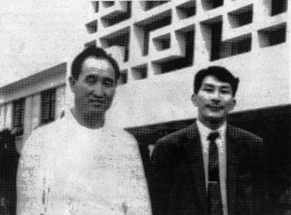 Reverend Dr. Sun Myung Moon with Sang lk "Papasan" Choi, one of the first Japanese Unification Church pioneers to America. Before 1971, the Unification Church in America consisted of four independent missionary groupings: the "Unified Family," a network of "centers" across the United States; United Faith, Inc., a string of "chapels" concentrated in the Pacific Northwest; HSA Arlington, Virginia related to the Korean Cultural and Freedom Foundation (KCFF); and the Re-Education Center in San Francisco. Each of the groups produced "Divine Principle" texts, established patterns of community life and developed distinctive ways of relating to American culture. Unfortunately, the groups were unable to unite. As a consequence, a national movement never emerged under the leadership of the Church's original missionaries. This all changed in 1971. By far, the most significant factor in this was the decision of Reverend Moon to shift the focus of his ministry from Korea to the United States. He arrived on December 18, 1971 and over the next three years the rival missionary groups went out of existence, national membership multiplied exponentially, and the Unification Church emerged as a national movement in America. At the beginning of the year, one member characterized 1971 as "the year of change for our Family." 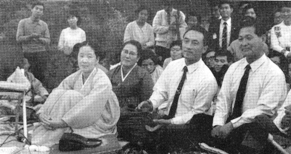 The Unified Family, led by Miss Young Oon Kim, flowed most naturally into the Unification Church of the 1970s. Dr. David S. C. Kim and Miss. Young Oon Kim, enjoy an ice cream bar with Reverend Sun Myung Moon at a concession stand at Cow Palace, first day of a boat show, 1973. The Unified Family, led by Miss Kim, flowed most naturally into the Unification Church of the 1970s. Her group made two decisive changes, one symbolic and the other substantive in 1971. First, the group changed its name from the Unified Family to the Unification Church; second, the group shifted its organizational strategy from a policy of "unregulated expansionism" to a policy of "reconsolidation" whereby they would consolidate "from twenty-one small groups to five points of power -- Berkeley, Denver, Los Angeles, New York, and Washington." 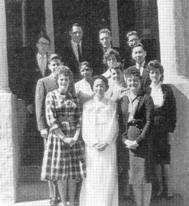 In addition to spiritual activities, Miss Kim's group contributed to the Church's anti-communist work and its efforts to unite science and religion. Her group organized the Freedom Leadership Foundation (FLF) in 1969 and began publishing The Rising Tide, later billed as "America's fastest growing freedom newspaper," in 1971. FLF generated additional organizations which opposed leftists on college campuses and developed contacts for Reverend Moon on Capitol Hill. Members also met a key contact who helped launch the International Conference on the Unity of the Sciences (ICUS). United Faith, Inc., or the "Northwest Family," led by Dr. David S.C. Kim, laid the initial foundations for the Unification Church's later ecumenical and interfaith activity. More so than the other missionary groups, the Northwest Family had the consciousness of being a "united faith movement." As early as 1963, they attempted to dialogue with Christian churches through "Articles of United Faith" based on Mr. Kim's vision of uniting Christian and Buddhist religions. (From left to right) Mrs. Hak Ja Han Moon, Mrs. Won Bok Choi, Mr. Young Whi Kim, first president of the Unification Church in Korea, and Mr. Won Pil Kim, one of the first missionaries sent to America. Col. Bo Hi Pak came to America in 1961 and two years later incorporated HSA-UWC Arlington, Virginia in 1963. In 1964, he was the moving force behind the creation of the Korean Cultural and Freedom Foundation (KCFF) which sponsored the Little Angels' performances in the United States. In 1966, he played a central role in establishing Radio of Free Asia (ROFA). In effect, Col. Pak became a free-lance ambassador of goodwill, foundation director, and an activist in the struggle against atheistic communism. He would later become Reverend Moon's special assistant and chief translator. Sang Ik "Papasan" Choi's San Francisco-based Re-Education Center steadily grew and reached the height of its development in 1971. However, unlike Miss Kim who adopted a church-theological approach, Mr. Choi utilized a character-educational methodology. His method was especially effective in appealing to disaffected young people: he tapped directly into the communal ethos and utopian idealism of the 1960s. From 1966-71, Mr. Choi fashioned a successful communitarian experiment which included active witnessing, multiple centers, student groups, weekend workshops and an "International Ideal City Project" in Northern California. Mr. Choi's group changed its name from the Re-Education Center to the International Re-Education Foundation in 1971. 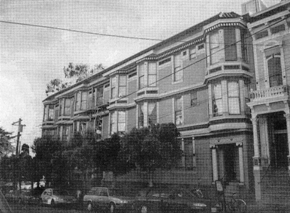 Along with the name-change, the group purchased a new headquarters at 44 Page Street, San Francisco allowing the community to engage in more ambitious projects. With a ballroom and balcony, Page Street headquarters also was well suited for a succession of "International Friendship Banquets. One particularly elaborate affairs brought in 500 guests, a flag ceremony, speeches by San Francisco Mayor -- Joseph Alioto and the Honorable Piero Mustacchi, Vice Consul of Italy. Mr. Choi was named "Man of the Day" by a local radio station and the foundation was approved by the government as an acceptable substitute for the draft. 410 Cole St., San Francisco served as the first church center for members in the San Francisco area. Despite its achievements, activities in America were peripheral to the mainstream Unification tradition, which was focused in Korea and, to a lesser extent, Japan. However, work there solidified to the point that the Church was ready to give serious attention to world mission. The most dramatic indications of this new direction were Reverend Moon's two world tours, the first in 1965 and the second in 1969. In 1965, Rev. Moon sanctified 120 "holy grounds" worldwide, including 55 in the United States, and four years later, sanctified 13 couples in the United States in the first Holy Marriage Blessing Ceremony ever conducted outside Korea. In December 1971, Reverend Moon returned to America as part of his third world tour. Although not apparent at first, this time he came to stay. Accompanied by Mrs. 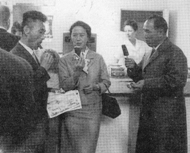 Moon, Mrs. Won Bok Choi, Mr. Young Whi Kim (President, HSA-UWC, Korea), and Mr. Ishii (Director, HSA-UWC Business Enterprises, Japan), the party arrived in Los Angeles, December 11, 1971. The group flew to Toronto, Canada, the following day, and on December 18, 1971, he arrived in Washington, D.C. Speaking almost every night from December 21st through the 30th, Reverend Moon assembled members for a four-day training program beginning Friday, December 31. During that weekend, details of Reverend Moon's "Plan" emerged to hold revival meetings in seven major cities including New York, San Francisco, and Los Angeles. The Plan changed everything. It would require not only individual commitment but also the cooperation of all missionary groups. The seven-city campaign, the first of the "Day of Hope" tours, was the first project ever carried out by the entire Church. It gave substance to a united national movement based on Reverend moon's vision. Miss Young Oon Kim and the first members in front of the 1309 Masonic Ave. Church Center in San Francisco. Eight of the 12 in this group are still Unification Church members. In this sense, it is appropriate to date the birth of the Unification Church of America from his arrival. Additionally, since Rev. Moon had never spoken publicly either in Korea or Japan, the birth of the American movement coincided with the beginning of a new phase in his ministry. The year 1971 was indeed "the year of change" for the American Unification Church. The previous period had been a time of planting or, more accurately, transplanting. Although the accomplishments achieved prior to the 1970s were noteworthy, they paled in comparison with what was to follow. During the 1970s, when the wider society settled down to become the "Me" decade, the Unification movement exploded in America. However, the Church's phenomenal growth and the reactions it provoked are not finally comprehensible without the events of 1971 and how they functioned as a bridge between the Church's early mission and its emergence as a national movement in American life.